Leo Cuypers, a Dutch pianist associated with the Willem Breuker sphere through early work with the reed player’s Kollektief and a number of albums released on his BVHaast imprint, died Sep. 5th at 69. Cuypers was born Dec. 1st, 1947 in Heemstede outside of Amsterdam to a father who was known for composing church music. He originally trained as a classical percussionist at the Maastricht Conservatory but was soon swept up in the burgeoning avant garde scene of his native Netherlands and larger Europe, switching to autodidactic study of the piano, mainly as a solo performer. 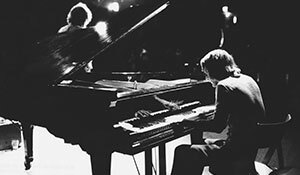 It was when Breuker saw Cuypers perform on television as part of the Loosdrecht Jazz Concours that he invited the pianist to the 1969 Baden- Baden Free Jazz Meeting, where he played with Karin Krog, The Baden-Baden New Jazz Orchestra under the direction of the Art Ensemble of Chicago and in a group with Eje Thelin, Bernt Rosengren, Terje Rypdal, Palle Danielsson, Barre Phillips, Tony Oxley and Claude Delcloo. He also appeared on the MPS album Gittin’ To Know Y’All, recorded during the festival, though his first appearance on record came the year before with prog-rock/spoken word artist Ramses Shaffy (Sunset Kiss, Philips). Cuypers would go on to record with the Theo Loevendie Consort (Chess, BASF, 1972), was the original pianist for the Willem Breuker Kollektief and appeared on numerous Breuker albums in the ‘70s, including 3 Muziekfragmenten Uit De Film De Nieuwe IJstijd Van Johan Van Der Keuken 1974, Twenty Minutes In The Life Of Bill Moons – De Achterlijke Klokkenmaker, Live In Berlin, W.B.K. ‘79 and the Breuker/Cuypers duo albums Live In Shaffy (BVHaast, 1974) and …Superstars (SAJ, 1978). However, despite performing with the bands of countryman Nedly Elstak and South African Harry Miller, his career was mostly as a leader. His debut was an eponymous solo release on BASF in 1972 followed by albums on BVHaast like 1977’s Theatre Music (featuring Kollektief members like Breuker and bassist Arjen Gorter) and perhaps his most known album, 1977’s Zeeland Suite, written for the New Zealand Music Festival and including Breuker, Gorter and Miller. Concurrent with this work was composing for film and ballet. After 1980, Cuypers led his own bands, which included countrymen like drummer Han Bennink (a former associate of Breuker’s) and trombonist Willem van Manen. Cuypers had a long, troubled relationship with alcohol, leading to a hiatus from performing in the early ‘90s. He reappeared in 1994 as a kindler, gentler improviser and worked mainly solo and releasing Songbook in 1995 on BVHaast. Unfortunately, Cuypers never got his drinking under control and he largely receded from view after his last performance in January 1998.